When I was Camp Director at our CSU Long Beach camps last summer, we had at least two Minecraft courses each week due to their popularity. I soon realized something strange, though, with the kids in these Minecraft courses playing a game in their free time. What's strange was that game was not Minecraft—marking the first time in my eight years at camp that I’d seen kids in a Minecraft course playing something other than Minecraft when time allowed. I couldn't help but wonder, what was this new game, and why had I not heard of it yet? Well, I quickly learned that game was Roblox. I'm here now to tell you all about it. Roblox is a free-to-play gaming platform, where anyone can use the Roblox software to make their own game for others to play. Meaning, players can join an infinite number of different worlds—all of which are various types of games created by other players. Roblox was first released for PCs in 2005, and then officially released in 2006. Most of the kids at my camp were playing obstacle courses, super hero training, or hide-and-seek. The rate at which these campers were creating such games inside the free editor really took me by surprise. I'd ask a student what they were doing, and I'd be met with a response like, “Making a game for me and my friend to play.” Questioning whether or not he could really create a full game during a short break, I followed up by asking just how easy of a task that was. Before I could even formulate my next thought, the camper created a brand new world that had not existed five minutes earlier. Then, with a push of a button, he posted his world to the Roblox website and his friend had already joined in. It was at this point that I realized this new platform was clearly the way of the future. How many players are on Roblox? There are 64 million players on Roblox, according to a November 2017 Business Insider article. To put that figure into perspective, Minecraft was reported as having 55 million players, as of February 2017. Roblox is extremely safe. It’s a platform built for kids, so the company has very strict language filters on all their chats, as well as a ton of settings parents can adjust to ensure their child’s safety. They also don’t hesitate to ban users who violate their terms and conditions. Additionally, Roblox is a member of various institutes and programs, like the Family Online Safety Institute and kidSAFE Seal Program, that are dedicated to ensuring the safety of children on the internet. Roblox is 100% free to make an account. From there, you can choose from a number of “Builders Club” options that you can add to your child’s account if you want to. Builders Club is a monthly subscription that gives your child’s account many different things. The most important one is a monthly allowance of Robux. Robux is the in-game currency that your child can use to buy and sell the products they’ve created. Your child can also use Robux to buy cool items with which to customize their avatar (always a big hit). Roblox is great for kids! It was designed with kids in mind. The best part is a lot of the maps are designed by kids, for kids. Because who knows what a kid wants more than other kids? Download our 2018 camp brochure to learn more about getting your child started with Roblox. Or, continue reading about the popular game! Roblox comes with its own editor that allows kids to easily download and start building their own world. The editor itself has a lot of functionality behind it, allowing kids to make anything they can imagine, while at the same time, being very intuitive. It’s not difficult to get started, and once you get the hang of it, the sky's the limit! The editor uses a scripting language called Lua, which is commonly used in the programming world by many different AAA companies. Adobe, Firefox, and World of Warcraft all use the Lua programming language, so getting your child early experience with it can go a long way toward their future. Roblox itself has many different educational applications, too. 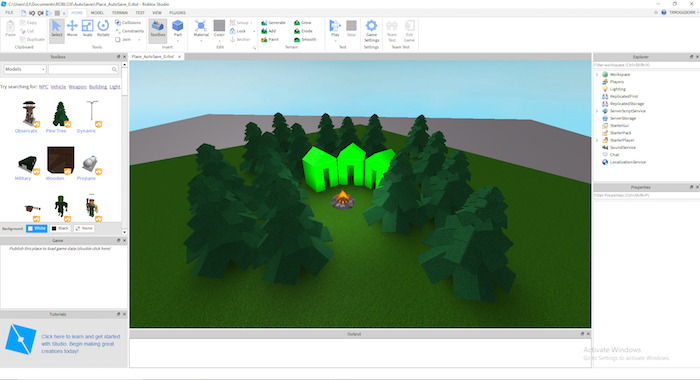 It can teach level design (what makes a game fun—the gameplay itself), algebra and variables via Lua, and even economics with Roblox’s in-game currency. Here at iD Tech we now offer courses with Roblox that can help kids get through the basics very quickly, and start teaching them advanced techniques so they can get right into making the game of their dreams—and maybe even make a couple of bucks with it too! Why do kids like Roblox? Because it’s so quick and easy to get into. The games can run straight from a browser, with kids getting to choose from hundreds of thousands of different ones to play. They can easily form a party with their friends and explore the different worlds that others have made. How is Roblox not just another gaming platform? I think that the coolest part of Roblox is the way that they monetize the different games. Let's say your child wants to make a game in Roblox. Inside this world of theirs, they can add buttons that allow players to give them Robux. Those Robux are now your child’s, and they can spend them on other games or, if they save up enough, can actually get paid US dollars in exchange. This is called "cashing out," and some developers have cashed out over $10,000 a month from their games. While results like this might not be typical of every user, the system is relatively easy, and already in place. Even if your child is just starting out, if they have a fun idea for a game and other users end up liking and playing it, they can make real money. What’s the difference between Roblox and Minecraft? There are quite a few major differences between Roblox and Minecraft. The biggest one is that, unless you’re a big company, it’s almost impossible to make money building your games in Minecraft. Also, to host your own online server for other people to join, you must pay a monthly fee in Minecraft. With Roblox, hosting servers is totally free. At its core, Minecraft is an infinitely expanding world for kids to move and place blocks of the same size. With Roblox, your child can build much more detailed objects because they have the ability to change the sizes and shapes of the parts. The last major difference is that Roblox has its own built-in scripting abilities. To change anything in Minecraft, you have to actually find and edit the code of the game, which, while a useful skill, can be more difficult. With Roblox, you can start coding basic functions into your game almost immediately with no restrictions. It’s an easier platform on which to start coding, for some. iD Tech now offers multiple courses in both Roblox and Minecraft, given the popularity of the two. I’m excited to see what kids can build this summer!